Your little one is discovering more and more each day. 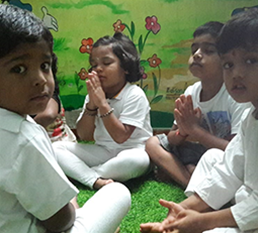 Our focus to teaching this age group children is to bridge the gap between toddler and preschool learning. 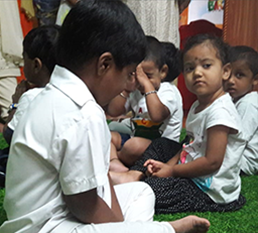 This is a crucial time during which children start developing social awareness, distinguishing right from wrong and develop a deeper understanding of the basic concepts they have been introduced to as toddlers. 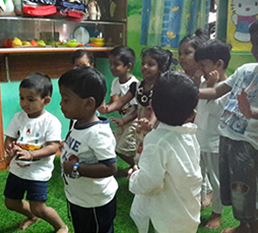 XTreme Kids aim to help your child learn about self-reliance and self-esteem through various games and activities. Their curiosity and energy are rewarded through activities that focus primarily on group work, encouraging them to interact with other children in a meaningful and collaborative way. Group activities provide exposure to the world around them and realize their relative position within this world. Advanced Motor Skills : Hands-on activities (coloring, building blocks), outdoor play time, tossing and catching. Cognitive Skills : Basic recognition of shapes and colors, puzzles, basic recognition of letters and numbers. Language and Reading Skills : Story time, basic reading and lettering. Creative Skills : Coloring, drawing, construction and art projects.